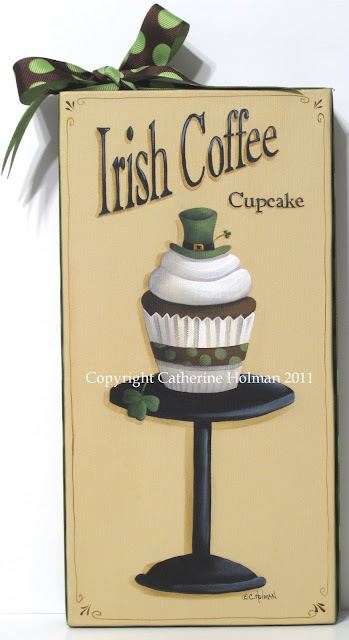 While I was researching for an idea to paint a cupcake for Saint Patrick's Day, I came across this green and brown polka dot ribbon that I purchased recently and that's where I found my inspiration for this "Irish Coffee Cupcake" painting. It's so much fun to design for a holiday theme. That's when I start getting bombarded with ideas. Hope you enjoy this one as much as I did. You can find it here on eBay. Looks like a little leprechaun has slipped into this fluffy frosting piled high on top of a yummy Irish Coffee Cupcake! This beautiful dessert is proudly displayed on a black pedestal cupcake stand. This cute dotted ribbon is wrapped around the edges and tied in a bow at the top. In case you are interested in trying these out for real, you can find the recipe on Martha Stewart's sight here. Love it Cathy! I am feeling all Irish today. We went to see the Celtic Woman in concert last night and it was amazing. PS...Happy Birthday to you. Hope your day was wonderful. Cathie, I love this cupcake. With a last name of McDermitt it is no wonder!! Happy Belated Birthday! Love it, Cathie, it's a beautiful painting! Sounds yummy too!